The Minerals Research Laboratory educational outreach program relates the laboratory’s purpose and activities to the general public. One hour “Rocks and Minerals” presentations are available in your classroom by arrangement, as well as one hour tours of the Lab and Pilot plant. For more information, contact the Educational Outreach Coordinator, Randall Beavers at randall_beavers@ncsu.edu. Bob Baldwin with one of MRL’s Rock Kits. 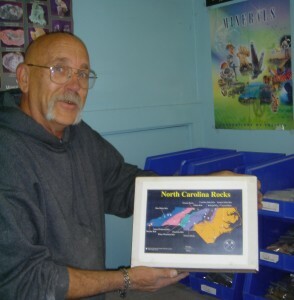 One of the most popular services provided by the MRL is assembling rock kits for use in geology and other classes. Each kit contains rock samples that represent the minerals of North Carolina, instructions, CD’s, DVD’s, Posters and Maps. One kit can serve 2 classes simultaneously if shared properly. To order a rock kit, use this form. For more information about the courses contact the Environmental Studies Department at UNC-Asheville.